Diazien Hossencofft laughing at television cameras moments prior to being transported to a state prison in Los Lunas, New Mexico. Soon, he’ll be moved to a prison in Wyoming. 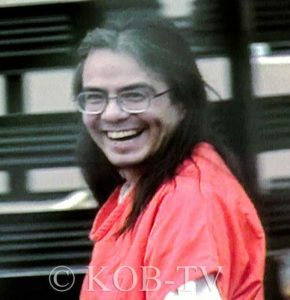 (Albuquerque) Even as Diazien Hossencofft stood still in the distant shadow, he fixed his gaze on news cameras on the other side of a locked security gate. This was “transport day” at the downtown Albuquerque jail. into a Bernalillo County Sheriff’s Department van which would take them to the state prison in Los Lunas. But Hossencofft would be told to wait in the wings. He would be escorted to a sheriff’s department car, destined to make the trip to Los Lunas apart from the larger group of inmates. Eventually, he emerged. And as he began his walk to that car, the parking lot seemed to become his stage for a brief moment; his eyes still locked on the TV cameras as KOB-TV photographer Mike Anderson shouted a question. Who does know where the body (of Girly Chew Hossencofft) is located? With that question hanging in the air, Hossencofft’s smile grew broader. Then he laughed out loud for about five seconds. His head raising upward. Then silence. The convicted murderer–his back now to the cameras–walked quietly toward the transport car. He was bound for Los Lunas a moment later. Soon, he’ll be on his way to a prison in Wyoming. 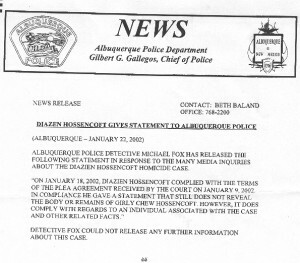 Also today, the Albuquerque Police Department issued a news release regarding Hossencofft’s statement to police last Friday. You can read that news release below. 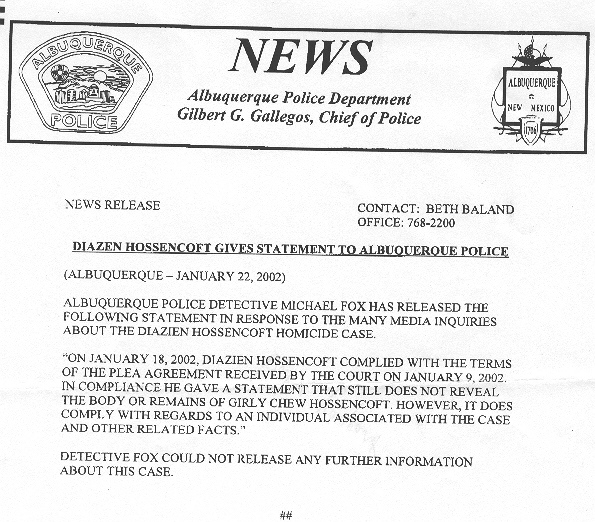 Albuquerque Police Department’s January 23 news release regarding Diazien Hossencofft’s statement to police.